Katey Walter is not a household name for most people, but among climate wonks, she’s a rockstar. You may have seen her in Earth: A Biography, introducing Iain Stewart to the lakes of northern siberia – she has become a minor youtube star for a clutch of videos showing wide eyed students lighting methane explosions on the frozen lakes of Alaska. Methane levels in the atmosphere continued to increase in 2009, and probably in the current year as well. In an address to the National Press Club, Energy Secretary Steven Chu sounded an alarm about America’s slipping technological leadership in the critical strategic area of renewable energy. China in particular has made a national commitment to leadership in renewable energy technologies. Unlike the US, China has a Renewable Energy Standard, a goal for a percentage of power to be produced by solar, wind, and other sustainable means. They expect to exceed the 15 percent goal, and may be producing as much as 20 percent of their energy renewably by 2020, according to Chu. Renewable energy is, of course, what climate deniers and their fossil fuel funders fear most. For example, Climate Denier Christopher Monckton’s website prominently features a plan to block “insidious” renewable energy standards that would jumpstart US competitiveness. This kind of organized, paranoid ignorance is good news for China, but bad news for the US, and for the planet in the long run. This wouldn’t be the first time that’s happened. It’s exactly what’s intended for this series, and I hear accounts like this every week. 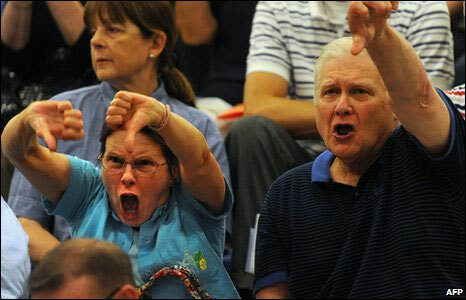 If you’ve just come away from holiday dinner frustrated at having to listen to Aunt Teabag and Uncle Dittohead’s anti-science rants, wishing you had just the right Climate Crock video to send them, your problem is now solved. Now Climatecrocks.com has an “Overview” page, which you can access in the menu on the right. There are links to each video organized by topic, as well as additional resources. With luck, you’ll be able to find exactly the right video, if not to completely turn deniers around, at least get them to shut up. Take a look at the list, and see if your favorite video is there, or if your topic of interest is addressed. Let me know in comments if there’s a way to make it more useful. There’s a building storm of indignation out there among those literate in science – who have gone from depression and despair at the tsunami of fossil fueled ignorance that’s passed for reporting and discussion of climate issues, – to real resolve, and a willingness to fight back, not just for the planet, but for the very idea that objective truth exists, and that science is a tool to find it. One of the opening salvos of that movement was probably fired by a quiet, unassuming professor at a Catholic University in St. Paul, who did not set out to place himself in the center of a storm. John Abraham responded to some email queries over the weekend. “I have long had an interest in climate change; my technical expertise has positioned me as a generalist in the area. I am not an expert in any single area or in climate science in particular, rather, my knowledge of radiative and convective heat transfer, thermodynamics, fluid mechanics, and numerical simulation has given me the background to interpret the present science. I began giving public lectures on climate change in 2007 to local community organizations, churches, and schools. Having visited Growing Power in Milwaukee this past summer while my son interned there, I’ve been sensitized to the exploding number of experiments in food systems designed for a future that is energy efficient, climate constrained, yet healthier, happier, and more prosperous. Watch for more experiments like this one – if you see something in your area, let me know. If you’ve been watching the video series you’ve seen a number of clips of Admiral David Titley, the Navy’s Chief Oceanographer, who has made himself much more visible in recent months, speaking out about what he knows is happening to the oceans and the arctic. 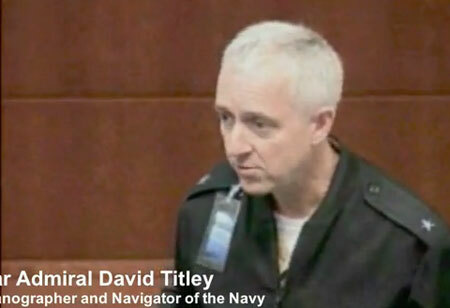 This week, Old Dominion University hosted Admiral Titley in a forum on the topic. Regardless of what’s being debated in Congress and state capitols across the nation, the U.S. Navy is readying for the effects of global climate change. This holiday season, if you’ve already had, or are anticipating encounters with Aunt Teabag or Uncle Dittohead, you might want to have handy the evidence of how the grown up realists in the US military are taking climate change seriously, even if Glenn Beck doesn’t. Here are the videos, if you missed them.